Our SAVORI Dog bowls are suit for the SMALL Pets up to 30lbs, like Dogs, Cats, Rabbits, Ferrets, Guinea Pigs, etc. Our feeders are made of top quality Stainless materials so they're not just safe and reliable, they are easier to keep clean too. The feeder's silicone and stainless steel construction meets all food safety standards and can be quickly rinsed or wiped clean after each use. The stainless bowls are also top shelf dishwasher safe if you're in a hurry. 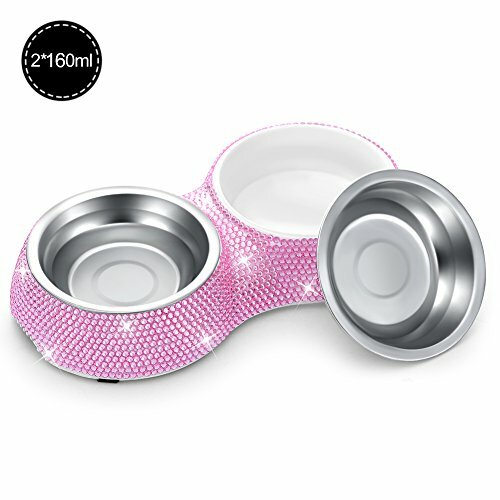 ☛[ Handmade Rhinestones & Large Capacity ] - Our Dog Bowls are made of Handmade Sparkling Rhinestones Material ,320ml in total Capacity (160ml for each bowl). ☛[ Non-Skidding & Non-Flipping Chassis ] - At the bottom of the pet tank has a rubber ring, can effectively prevent the bowl skidding and scratching the floor, keeps your floor safe and clean. Helps save much more of your time to clean the mess. ☛[ Rust Resistant Stainless Steel Bowls ] - Our SAVORI Set of 2 dog bowls are eqqiped with High quality stainless steel material, heat resistant, corrosion resistance and rust resistant, make this bowl more durable and suitable for long-term use, especially for holding hot food. ☛[ Easy to clean ] - The removable bowls are really easy to clean and what is the most perfect - dishwasher safe. Now you may be positive that your dog, cat, pup or other pet gets only fresh and healthy products. ☛[ 100% Satisfaction Customer Service & Guarantee ] - If you have any questions about our products, please contact us by email with no hesitate.SAVORI offers 24 hours friendly customer service, 100% refund if there is any problems.30 days money back guarantee. If you have any questions about this product by SAVORI, contact us by completing and submitting the form below. If you are looking for a specif part number, please include it with your message. OmniPet 2 quart Anti-Ant No Tip Stainless Steel Pet Dish with Interior Dimensions 8" Diameter, 1.75"